"Dawn of the Planet of the Apes" is loud, smart and ferociously committed to its premise, and it leaves an intriguingly bitter aftertaste. 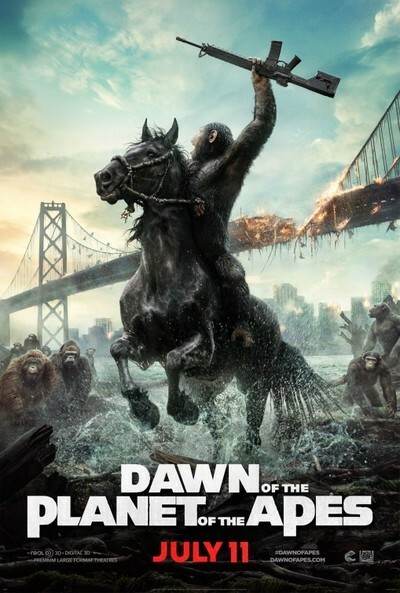 Like its predecessor, 2011's "Rise of the Planet of the Apes," it borrows situations and images from the 1960s and '70s "Apes" films and re-creates them as epic dramas. These new installments in the series aren't as satirical as the original "Apes" movies, but they're just as playfully political; the biggest difference is the sense of intimacy. The politics are personal, and they play out through the character of Caesar (Andy Serkis). "Rise" portrayed Caesar as a victim turned rebel. His backstory fused the title character of "Flowers for Algernon"—about a simple man implanted with extraordinary intelligence by a scientist—with Spartacus. There were political elements in the script, mainly having to do with the ethics of animal testing. But for the most part "Rise" was a traditional hero's journey. It was about an ordinary ape realizing his extraordinary potential and becoming, pun intended, a guerilla warrior, inspiring his brothers and sisters to overthrow their human oppressors and make a homeland in the Northern California forest. The film's insistence on anchoring every event in strong, simple emotions—most of them originating in the constantly evolving character of Caesar—made "Rise" surprisingly intimate and wrenching. Caesar was your entry point into the story. You identified with him completely, as you did with King Kong, Frankenstein's monster and Dumbo. You felt his pain, and cheered when he stood up for himself. The mostly excellent "Dawn" expands and complicates Ceasar's story by showing the aftermath of revolution, when the romance of rebellion has faded and boring old reality sinks in. Caesar and his fellow apes have settled in the forest amid remnants of a civilization cast into ruin by simian flu. A small group led by Gary Oldman, Jason Clarke and Keri Russell appears. These humans ask Caesar if they can please reactivate the dormant hydroelectric plant in the woods to restore power to San Francisco, where a few hundred plague survivors have settled amid stone-age squalor. They claim to seek nothing but peace and comfort. The humans' request sparks torment in Caesar and sets the plot in motion. In time, Caesar's divided soul becomes a metaphor for two families of sentient mammals angling for global dominance. Ape reflects man in these movies, and man ape. There's even a brazenly corny but effective bit of silent-film cross-cutting that draws correlations between characters that represent the diplomatic (or "accommodationist") attitude toward resolving conflict and the hardline approach. Caesar grapples with these conflicting impulses within himself even as they're externalized through his ape foil, Koba (Toby Kebbell), a scarred, bitter survivor of laboratory torture who once was loyal to Caesar but now thinks he's gone soft and is at risk of becoming a species traitor. Their conflict is mirrored in the struggle between Clarke's Malcolm (the human Caesar) and Oldman's Dreyfus (who seems reasonable at first, but reveals himself as Koba's counterpart). The direction, by Matt Reeves of the soulful vampire remake "Let Me In" and the half-magnificent, half-lame found footage monster flick "Cloverfield," strikes a marvelous early Spielberg vibe, alternating humor and terror with plot-motivated directorial flourishes (including a "Children of Men"-style tracking shot through an ape-infested warehouse and a hair-raising ride atop the turret of a tank). The script, credited to Mark Bomback, Rick Jaffa and Amanda Silver, makes for muddy allegory, perhaps purposefully so (though its attitude toward guns is less editorial-page modern than many have claimed), and it has major flaws, including a too-typical things-crashing-into-other-things summer movie climax, flat human characters (compared to the apes), and a dearth of notable females (this is biologically defensible on the apes' side of the story—maybe—but certainly not on the humans'). And yet the script satisfies because it's fair to every character. You understand Caesar's and Koba's and Malcolm's and Dreyfus's points-of-view even when they're making destructive choices. And when you trace the chain of events that leads to the third act's man/ape showdown, you realize it's impossible to say for sure which side "started it." "Dawn" shows Caesar grappling with the irritations and agonies of leadership. During moments of impending and erupting violence, some of which have an almost midnight-movie ugliness, the film's pop-operatic boldness and orange-brown torchlighting fuse with the weirder parts of composer Michael Giacchino's score (like a calliope heralding a circus in hell) to suggest that we are watching the simian cousin of Francis Ford Coppola's mob trilogy. If "Rise," about the unlikely savior of an endangered clan, was "The Apefather," then this sprawling, messy, often sad sequel is "The Apefather, Part II," turning brother against brother (on both the human and ape sides of the dramatic fence) in a war for resources and turf. The film starts and ends with rhyming closeups. The first promises a gentle and hopeful future, the second certifies that the tribe's survival must be purchased at the cost of its soul. Heavy hangs the furry head that wears the crown.